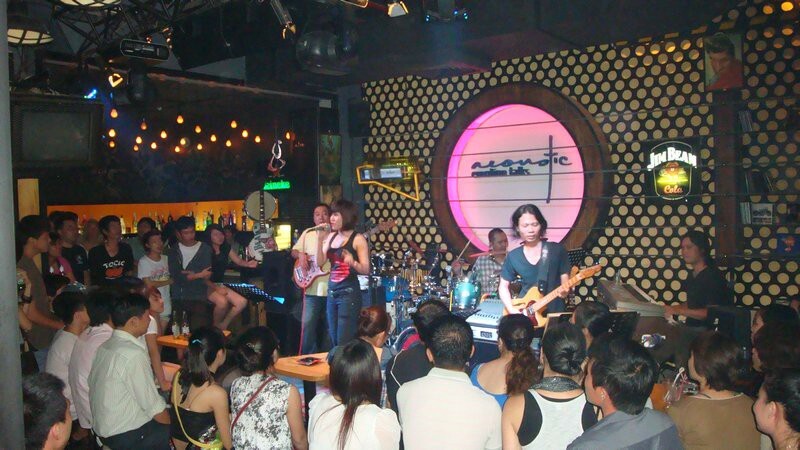 Nightlife in Ho Chi Minh city are different in distinct districts. Downtown in District 1, the center of the city has almost all the entertainment you can search for: from the rooftop bars, high rolling casinos to smooth jazz bands, shopping malls. There are a variety of selection for you to choose for hanging out in District 1, this is the reason that many people come here every night. 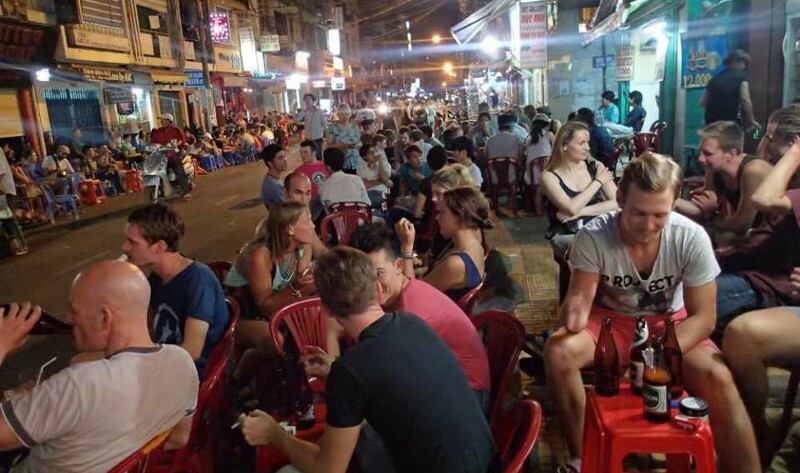 But move a few kilometers west to District 3, where you can see the backpacker street of Pham Ngu Lao with its boisterous street bars, cheap meals and good time vibe, a good place to spend night time. Whatever your ideal night out in Ho Chi Minh city is, with our top 10 destination for nightlife, you can enjoy the best experiences with you companions which we are sure you can find somthing that suitable for your taste. 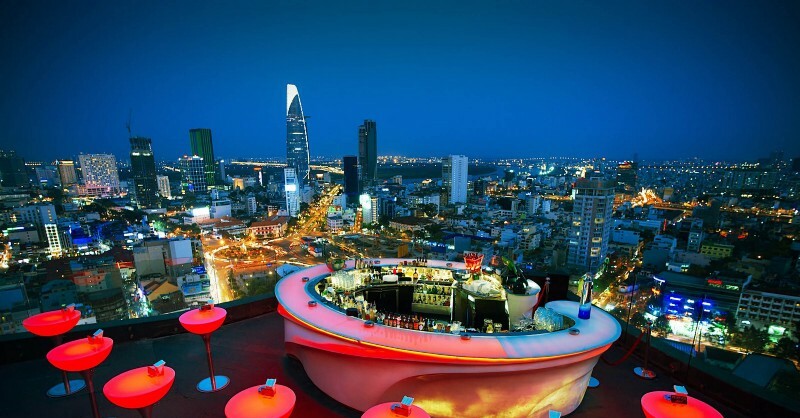 Ho Chi Minh City has one of the most impressive collections of rooftop bars in the world. From the colonial charm of Saigon Saigon to the chic and modern style of the Chill Skybar, there is a rooftop spot to suit any mood in Saigon. Sit back with a cocktail and soak up the stunning view of Ho Chi Minh City from sunset until the early hours of morning. 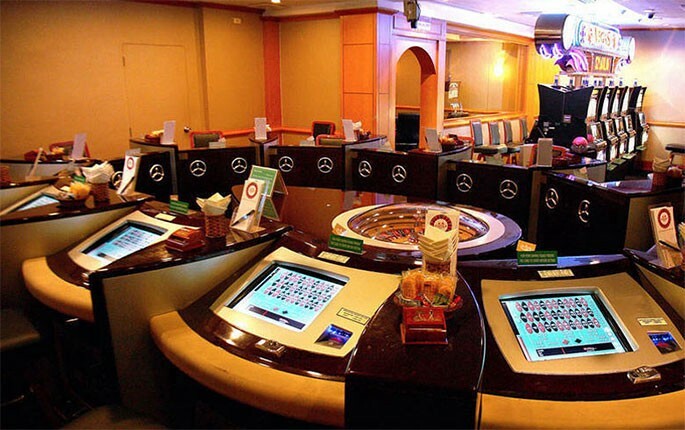 Several of the best hotels in Ho Chi Minh have casinos within so you can hit the roulette table, play some mah-jong or get lucky on the slot machines. Two of the biggest casinos in Saigon are located in the Caravelle Hotel and Sheraton Saigon Hotel and Towers. Casinos in Ho Chi Minh City are not on the scale of Las Vegas and some games, such as hold ’em poker, are available on a computer screen only, but having a flutter is still an enjoyable way to spend a few hours. 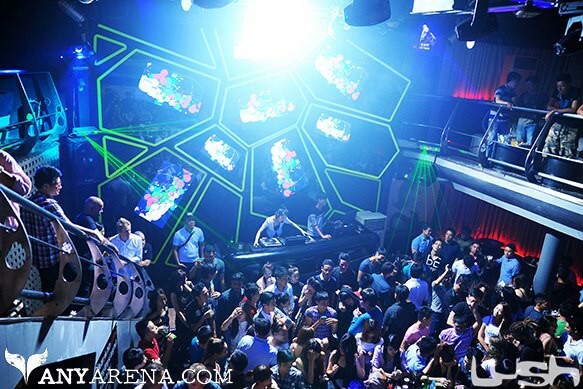 Lush Nightclub is a premier nightlife hotspot in Ho Chi Minh City. It is the place to see the young and beautiful of Saigon, dressed to impress and not afraid to spend a little cash. The venue is kitted it out in an industrial chic style, with space to dance and an upstairs area with ample seating. Music ranges from house to hip hop and a bit of mainstream party pop, depending on the night. For a romantic night in Ho Chi Minh there is nothing better than taking a leisurely cruise down the Saigon River. 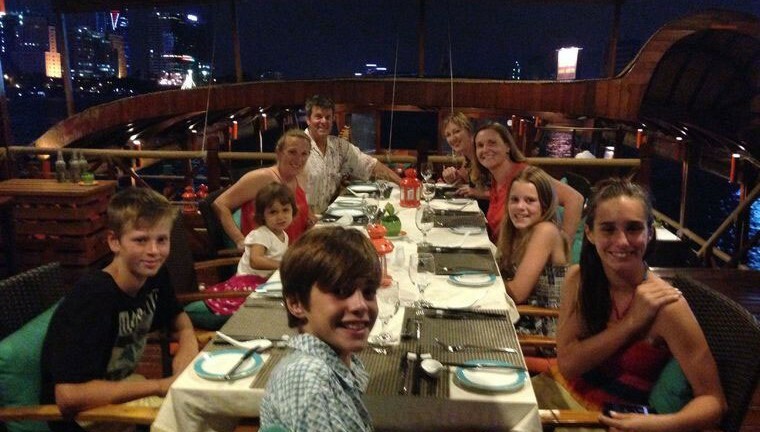 The Bonsai Dinner Cruise combines a slow river journey aboard a beautiful wooden barge with a sumptuous feast of western and Vietnamese favourites. Along with dinner and the views of the HO Chi Minh City at night, there is a live jazz performance on board and a traditional Vietnamese dance to enjoy. Ben Thanh Market plays a central role in Ho Chi Minh from early morning until late at night. Although busiest during the day, night time brings many food vendors onto the streets serving a wide variety of seafood, as well as many fashion stalls and souvenir type stalls. 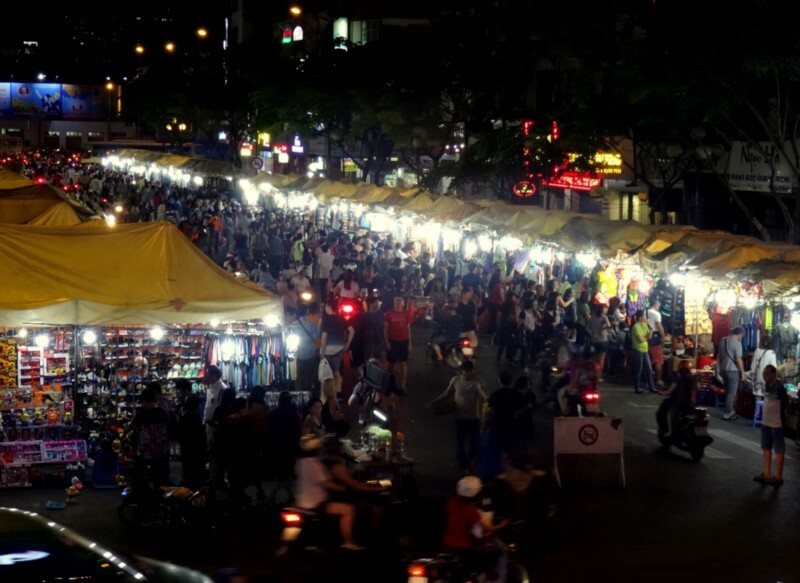 The night market is setup alongside the market on Phan Boi Chau Street and becomes a pedestrian zone from 19:00 until 24:00 so you can browse at your leisure. Be aware that prices start very high here and bargaining is a necessity. 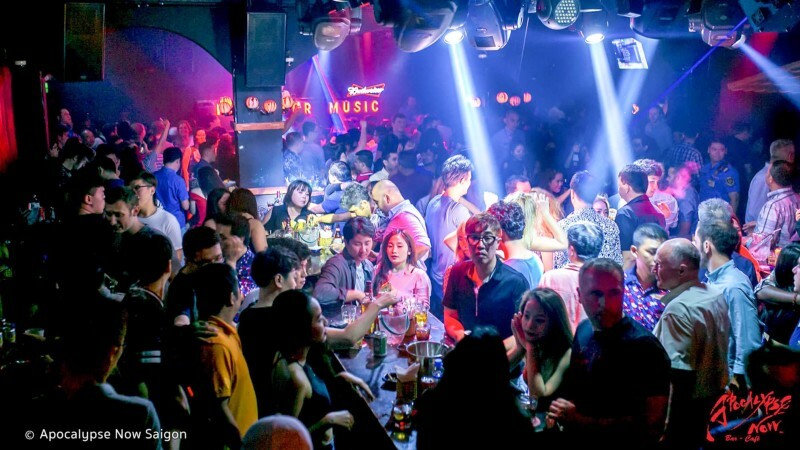 Apocalypse Now is a legendary nightclub in District 1, attracting a healthy mix of backpackers, expats, and Vietnamese ladies looking to mix and mingle. Set over two floors, it isn’t the most sophisticated of clubs, but its lots of fun, with cheap drinks promotions, western pop tunes and plenty of space for dancing or chilling out with a few drinks and playing some pool. Open until 04:00, it is also one of the last places to close at night so Apocalypse Now is a great place when you’re in the mood for that one more drink. 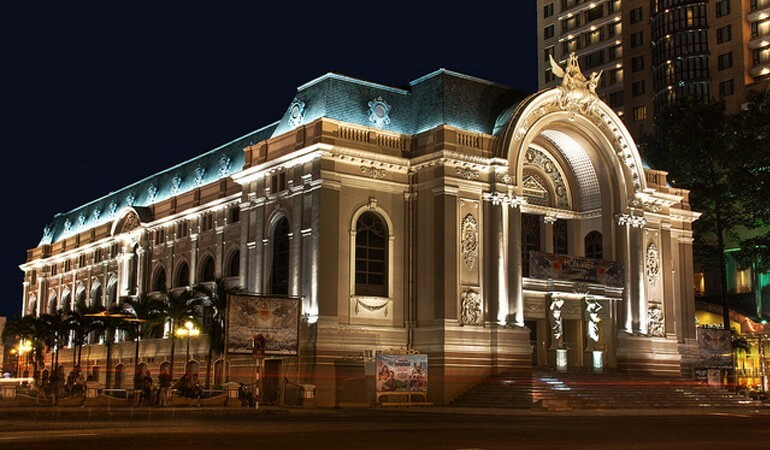 The Saigon Opera House is a beautiful colonial building in the centre of Ho Chi Minh with a stunning facade of ornate winged statues and curved window frames. Inside the opera house the culturally inclined are able to witness the best of the fine arts that visit Vietnam seasonally, and although there is no consistent performances, events are common. Priced at VND 100,000 upwards, the range of performing arts on show includes ballet, musical concerts, Vietnamese traditional dance and live theatre. 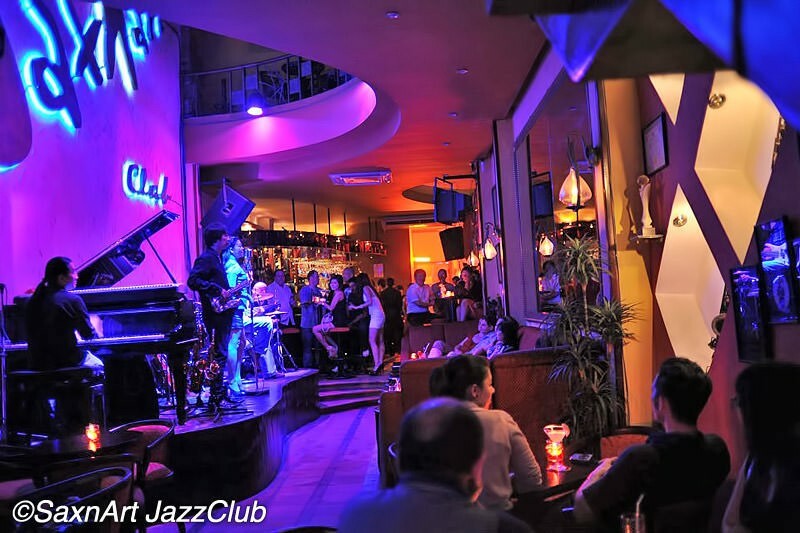 Sax n’ Art Jazz Club is an institution in Ho Chi Minh, with Vietnam’s most celebrated musicians performing here as well as international guest artists. Located on Le Loi Street in the centre of District 1, there is a cover charge which comes with a free drink which is a great deal considering this place offers some of the finest live jazz in the city, but drinks prices are higher than most other places in town to compensate. With a dark, cave-like interior, all effort is made to keep the focus on the musicians on stage.